Juicing: everyone loves it, and everyone knows it’s good for you. But whether you’re new to the juicing world or a seasoned professional, you need to know about slow juicers. Slow juicers are the best type of juicer to use if you want to reap the benefits of the produce you’re juicing. We’ve tracked down the best slow juicer for every budget, so you can get the most bang for your buck. That’s a pretty impressive list of benefits that come from consuming plenty of produce! And the easiest way to enjoy these is by juicing fruits and vegetables regularly. Juicing is the natural choice to make. Many people don’t know that there are different types of juicers available. Today, we’re looking at slow juicers. A slow juicer is also known as a masticating juicer. The key difference between a slow juicer and other juicers is the speed at which it juices. A slow juicer processes the juice at a much slower rate. This process is essential to keeping the most nutrition in every juice. What makes a slow juicer superior? So why is a slow juicer the better choice? It comes back to the slow processing time. When juicers make juice really quickly, the juice is exposed to heat and a lot of oxygen. This increases the loss of heat and oxygen sensitive nutrients such as vitamins and antioxidants. So when you juice quickly, you lose the benefits quickly. With a slow juicer, the opposite happens. By slowly extracting the juice from the fruit and vegetables, the juice is exposed to less heat and oxygen. This means that more nutrients make it out of the produce intact, ready for you to consume and enjoy. In fact, slow juicer made juice can be kept for up to 3 days in the fridge before oxidizing. That means that you can whip your juices up in advance, but still enjoy all of the nutrition a fresh juice can offer. People also say that slow juicer made juice tastes much fresher and more delicious. That’s a pretty good reason to go slow with your juice! Ready to start your slow-juicing journey to health? We’ve found the best slow juicer for every budget. So no matter where your finances are at, you can include nutrient-dense juice into your daily diet! Just because you have a low budget, doesn’t mean you have to miss out on slow-juicing goodness! Here’s our top recommendation for a budget slow juicer. 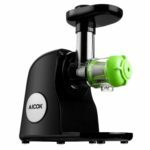 Aicok’s masticating juicer can create a tasty nutrient-dense juice for you every time. With an 80rpm speed and a reverse function to avoid any clogging, it’s easy to use and clean. Whether you want to juice high fiber vegetables or soft sweet fruit, this will get maximum yield out of every piece. A 2-year warranty means you can be confident in your juicing ventures. You don’t need to empty your bank account just to enjoy a high-quality juice every day. These are our favorite mid-range slow juicer options. 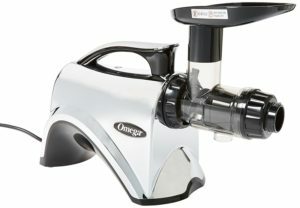 For an easy to use masticating juicer, the Omega 8004 is an ideal choice. Juicing at 80rpm keep the flavor and the nutrition locked into your juice. Looking to include more than just juice in your life? Omega Nutrition Center Juicers can also be used to make other healthy options – think nut butters, baby food, and soy milks. Want a juicer that looks good and is easy to clean? The chrome color of the Omega 8005 is resistant to stains, making it easy to keep clean and shiny after every use. And since it comes with a 10-year warranty, you can juice without worries for years to come! Ready to take the next step in your home-made nutrition journey? Omega Nutrition Center Juicers can also help you to create other healthy options, including baby food, nut butters, and dairy-free milks. Ready to go for the best of the best? Check out our favorite picks for high-end slow juicers. 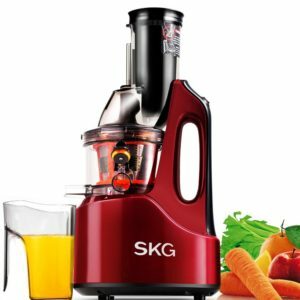 The SKG Masticating Juicer is all about minimal oxidation for maximum flavor and benefit. With just 60rpm speed and a wide chute, it produces high-quality juice with little preparation needed. The SKG prides itself on a high yield of juice, so you’re getting the most juice out of every piece of produce. The sleek design will look amazing in any kitchen and is easy to clean. With a warranty that keeps your juicer protected for longer, SKG is a great choice for a slow juicer. Every part of the juicer is made of materials designed to reduce oxidation and lock in flavor. With a warranty that keeps your juicer protected for longer, SKG is a great choice for a slow juicer. 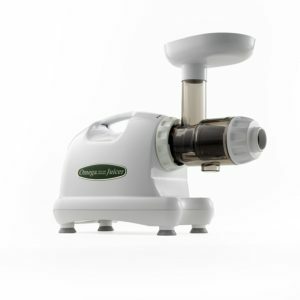 For delicious juice every time, this masticating 80rpm juicer is the way to go. This gorgeous juicer not only slow-juices, but you can also adjust it depending on the produce you’re using, with 5 different settings. So you get more high-quality juice out of every produce option. Just like the other Omega Nutrition Center Juicers, you don’t have to stop at juice. You can also make other healthy options, such as dairy-free milk, nut butters, and even baby food. 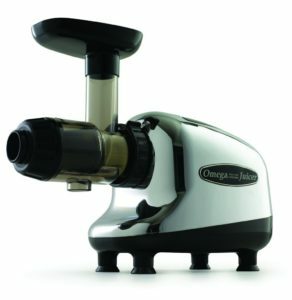 This juicer is also an improvement on other Omega juicer options, thanks to the wider feeding chute and greater yield of juice. So if you want to upgrade your juicing experience, this is your pick. If you’re looking for all of the benefits that come with juicing regularly, make sure you get yourself a slow juicer. This will make sure you get all of the nutrients that fruit and vegetables have to offer. You’ll be feeling healthier in no time!